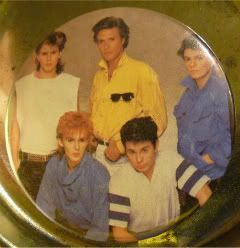 joy magnetism: Happy drop week, @duranduran! Welcome to Duran Duran week on joy magnetism. Yes. A whole marathon, with likely nothing but pretty pins magnets for each day. What? My sister stumbled across a whole tin of old pins of mine growing up, so I've quickly turned most of them into magnets. Some of them I remember, but I didn't have one of those cool jean jackets with pins all over them in school, so I haven't a clue what I did with these pins. Anyway, I figured I'd just use the majority of my Duran pins in honor of their newest work, All You Need Is Now which drops today in CD and special CD/DVD editions. Totally bought the autographed special deluxe edition from Newbury Comics. What? Ya'll know how much I love my Duran Duran. I can't wait til it gets here - I'm like stalking that PO box. In the meantime, I'll just keep listening to the iTunes album version I bought earlier this year.